Imagine how hard just a single bee works in one day. Consider that bees will feast from around least 2,000 flowers daily, their tiny wings beating upwards of 10,000 times per minute, carrying pollen, and dramatically assisting our food supply. Bees often get thirsty, and they need safe and clean water sources. The problem or our little pollinator friends is that water is not always available. Bees need shallow water to drink from so they do not drown. Shallow water evaporates quickly. For this reason, birdbaths are not the best option as bees tend to drown if the water is not be shallow enough. As for river and lakes, bees risk their lives trying to get water in the presence of fishes, frogs, and other wildlife, not to mention the risk of being swept away in water currents. To help hydrate our little pollinators, set up a water feeder by filling a pie pan with marbles and then water. 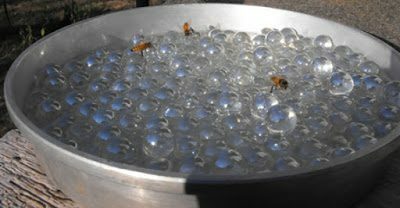 The marbles give the bees a spot to land so that they don’t drown when they come to drink.